Coyote hunting dogs help hunters protect ranch livestock such as calves, lambs and kid goats from coyote predation. They play integral roles in population control and pelt hunting. Each role requires a significant amount of training and obedience for a successful hunt and for the assurance of the safety of the dogs. Although largely left to a hunter's personal preference, certain characteristics in a coyote hunting dog are absolutely necessary. The dog must possess intelligence and a willingness to be trained. He must master obedience as well as recognize the cat-and-mouse game that is coyote hunting. He must have a high prey drive and have enough stamina to work for hours on end. The dog must be athletic enough to escape a coyote or pack of coyotes yet strong enough to turn and fight if he must. He should be at least equal to the size of a coyote but not so large that his size would intimidate and frighten away his prey. The preferred dog breed used by many coyote hunters is the mountain cur, or a cross-bred dog that includes cur. Other breeds used in coyote hunting include greyhounds and other hound breeds, Labradors, and dogs mixed with pit bull terrier. Prior to beginning any advanced field training, your dog must first master basic obedience. This is crucial to the success of field training as well as to the safety and well-being of your dog. If you are unsure how to train your dog in basic obedience, sign up for training classes at your local pet store or through your local animal shelter. Your dog should sit, stay, heel and return on command before progressing to any field training. Spend plenty of time building a strong foundation with your dog prior to engaging in any actual hunting with him. Begin by exposing him to everything possible, keeping him on a 20- to 30-foot leash during your initial outings. Introduce him to prey you don't want him to chase, such as porcupines, snakes and skunks, and immediately correct him when he tries to give chase. Once he is comfortable in a field setting and can reliably resist chasing anything and everything that runs, hops, slithers or slinks about, you can begin allowing him to run loose on your outings. Take your dog with you a few times as you hunt coyote. 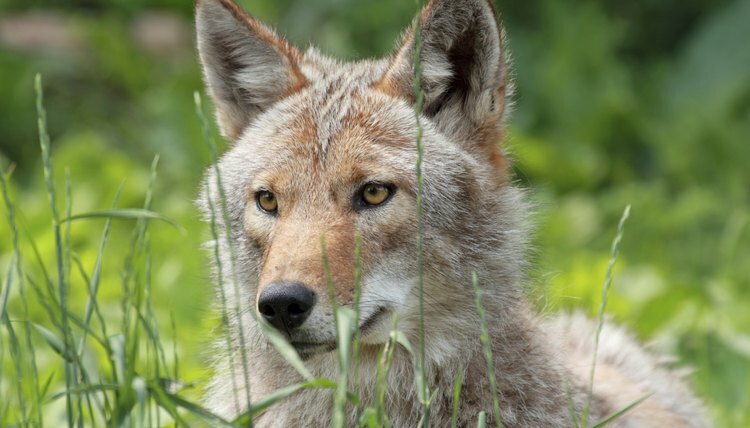 For these first few outings, keep him tied in a safe location, preferably where he can see the coyote as you call it in, but out of firing range and far enough away from the muzzle blast of your gun to protect his hearing. Try to let him see everything that is happening. Once you call in the coyote and take it down, release your dog and allow him to find the downed animal. Praise him thoroughly when he does find it. Once he has learned to find a downed coyote, have a friend drag the coyote carcass further and further away from your stand, thus teaching your dog to track the coyote over greater distances. Once your dog has mastered coyote hunting and tracking skills, and can reliably return to you on command, he will prove a useful companion in the field. He will be able to decoy, attracting the attention of coyotes and luring them in to the stand, as well as to track and recover wounded animals. He will not only provide welcome companionship on your hunt but will increase the success of the hunt as well. What Can You Put in a Hamster Cage Besides Cedar? How Often Should You Change Hamster Shavings? What Can You Feed a Hamster if You Run Out of Hamster Food? Can You Keep Pet Bunnies Inside Your Home?